The Eagle Nebula is a stellar nursery: a place where new stars are born. It’s about 7,000 light years away from Earth (for comparison, the nearest star to our sun is about four light years away). The Eagle Nebula contains three enormous pillars (a few light years high), growing like stalagmites from the floor of a cave. 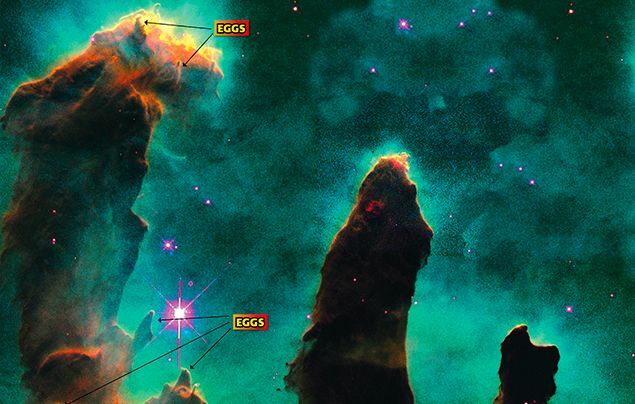 These are called the Pillars of Creation. These pillars are made from gas and dust left over from the Big Bang and thrown out from previous generations of stars as they died. In this photo, the pillars are being shaped and recycled into the next generation of stars. They’re incubators for stars! Originally, this part of the Eagle Nebula was a giant shapeless cloud of cool hydrogen gas and dust. But then, a nearby giant star blasted into existence just outside of this photo, up at the top right. The hot young star blasted out huge amounts of charged particles and ultraviolet radiation. These blew away most of the giant cloud, which exposed the three dense pillars. Emerging from the outside of the pillars are 73 small dense ‘blobs’, called Evaporating Gaseous Globules, or EGGs. About a dozen of the EGGs will have baby stars inside them!